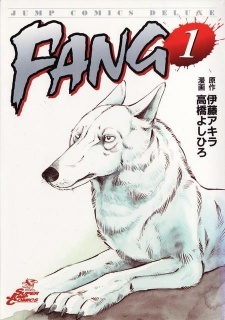 Fang is the son of a white wolf and the German Shepherd, Asukari. When Fang was a puppy, the General's men attacked his home, killed his mother and shot his right eye out. To get revenge, he and his human trained to become military soldiers and investigators. Even though they have assignments to do, they still try to find out who entered their home on the night Fang lost his mother. What they don't know is that the boss of Fang's owner is the very same man whom thy are searching for. After an close encounter with him during a mission, they both realize that he's the villain. They hunt him for weeks and when they finally stand face to face with him, Fang jumps to kill him. He doesn't succeed and the General is crawling wounded through the grass to find his gun and kill Fang. However, the General falls upon the gun and accidentally pulls the trigger. He dies instantly. Fang has finally gotten his revenge and can return to his life as a professional military dog. Fang was published in Finnish by Punainen Jättiläinen from June 13 to August 15, 2014.